Hardware store sells 18ga Aluminum Wire. Perfect! Easy to bend looks great installed. 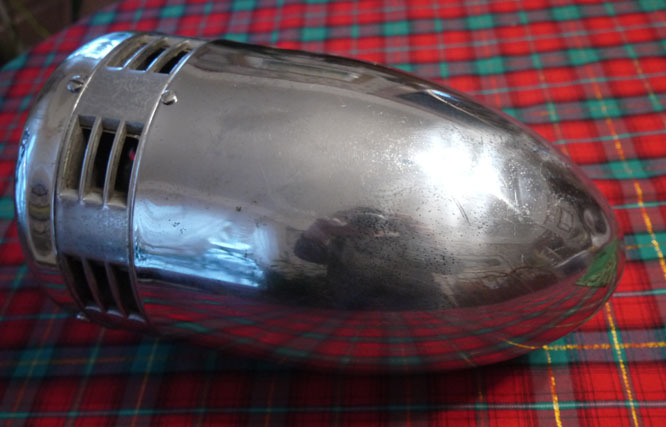 The only reason the original wire was so tough - it was pounded thru two pieces of sheet steel! Once the holes are there, a lightweight staple holds the pieces together just fine. Just use a small drill to pierce the rubber membrane easily while holding the assembly of the shroud, membrane and retainer clamped together. I hope anyone planning to do this in the future first reads this thread. Cool weather keeping me from painting my engine tins. Once I can get a couple warm days above 70, then I will do my tin refurbishment. still looking for a way to do painting on these cool days. Do you have additional pics that can show others the orientation of the flappers,as it pertains to full heat,etc? I'm considering removing the fresh-air heater/blower box assembly and yours is the only "cut-away" (for lack of a better term) that I've seen. I would stay away from aluminum wire because it fatigues very easily... quickly cracks and breaks. I believe normal engine vibrations would result in having to re-do your fasteners. Were you looking for a view different than the ones I posted on October 15 (page 9)? Great views, Steve. Photos have everything needed to make sure tins zre right and seals properly installed. I will be printing them and posting them on my garage wall to reference when I get working on my van engine tins. I am looking at powder coating, but have not bought an old electric stove to do the baking. The big pieces would still needed to be outsourced. I have the gun now, awaiting ordering paint until I have the stove. Can you PM me the info on the paint you used? Thank you. Al, most decent sized powder coating companies are likely to do it cheaper (and better) than what you could do it yourself. I provided media blasted shrouds and the power coating, matte black, cost $100. Doing a lot of detail work removing the final traces of the Firebrier’s undercoating, hoping to prime and paint within a week. As in the rear, a few undercarriage body repairs will still be needed. Some of those repairs are awaiting arrival of replacement body parts – weird west coast weather is not helping – but I’ve made some repairs that needed fabrication. Where to cut the panel can be a tough decision with several compromises. Ideally the replacement piece is as small as possible requiring the easiest fabrication, but obviously large enough to weld to decent metal, which can be hard to judge when you can’t see the back side. 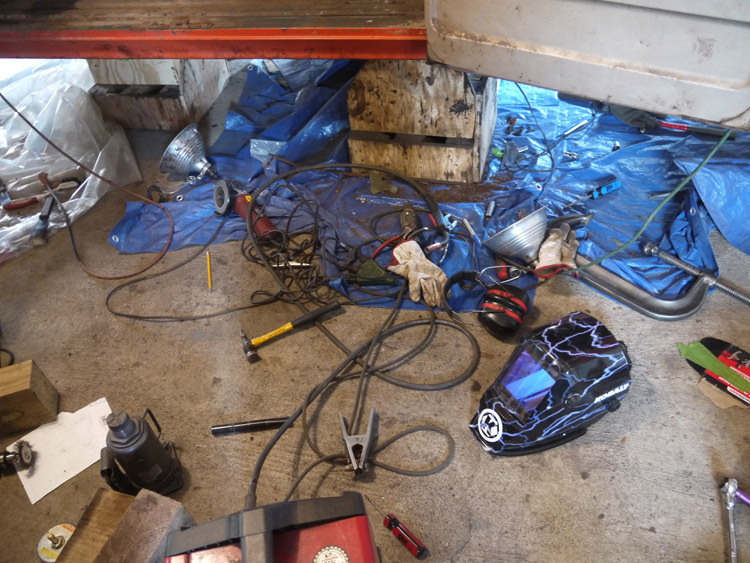 However, when working in tight spaces like this, it’s also necessary that the seam will be accessible to the welder (I use a Mig) and later by a grinder to smooth the weld. 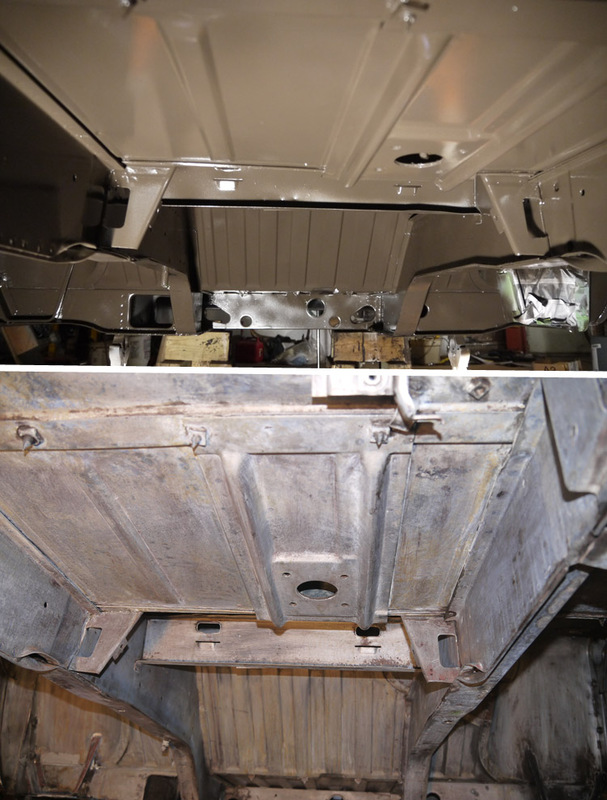 As you can see here for the left side, after I removed the panel and did some cleaning, the inside of the cowl was painted with POR-15, masking the edges where welding will occur. I fabricated replacement panels using 20 ga steel. It takes a lot of metal work to replicate the original pieces. Here’s the left side replacement before drilling the holes in the bottom lip; several holes were also drilled for plug welds. 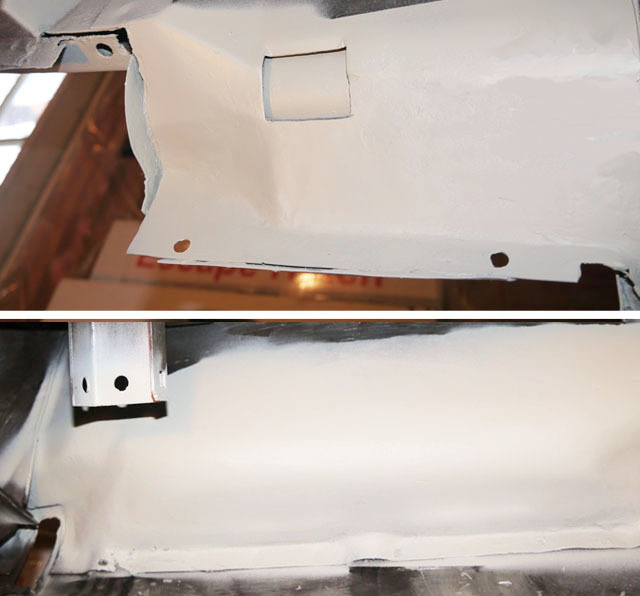 The back sides of replacement panels are treated with weld-through primer. Fitting the replacement into place can be tricky, especially in tight spaces like this, and using several strong magnets helps. My method for getting a good fit is to initially make the replacement slightly larger than the hole, and then remove the excess old metal by cutting along the edge of the replacement with a Dremel tool (409 or 420 cut off blades work well), and spot welding the pieces as I go along. 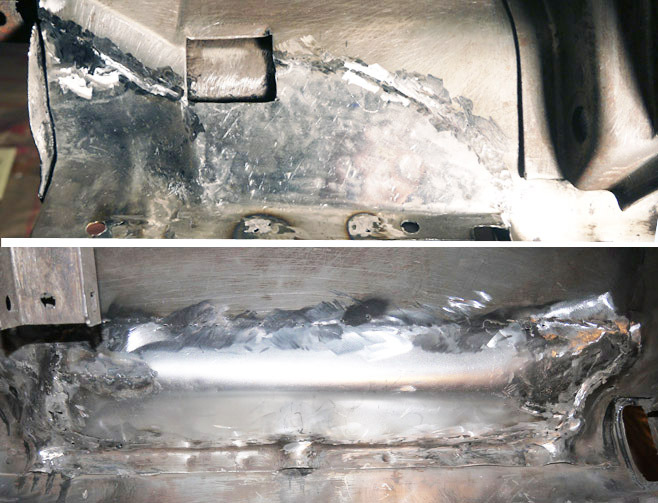 This assures a tight fit between the pieces, and the spot welds hold the piece in place. Hopefully, a continuous weld can be applied without blowing through any old metal, but that rarely occurs in my universe. Here are the two panels with the welds ground down. I use a 4 1/2“ angle grinder, where accessible, and a Dremel tool with fiber impregnated cut off wheels. I use All Metal filler to smooth the surface of the welds and fill any pin holes. This stuff is rock hard and water proof. I went ahead and applied primer so that I can better assess the final appearance. 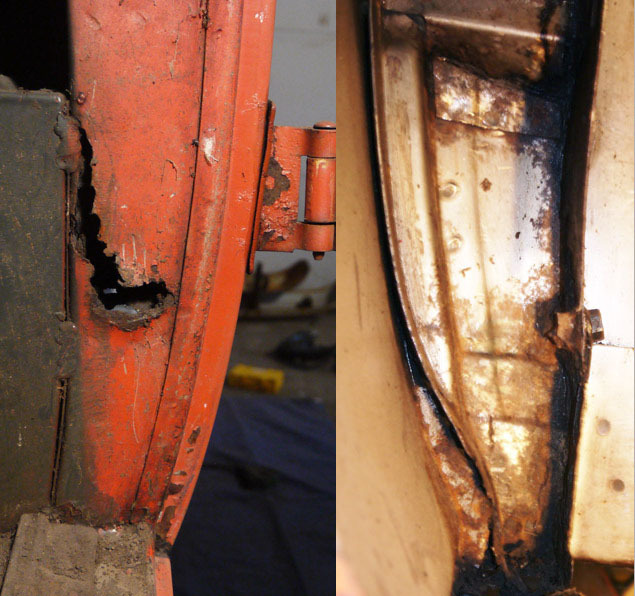 Another repair has been to the left side rear intermediate side door jamb, which was rotted on both sides. The picture of the back side shows the bracing below the hinge, most of which was beyond saving. 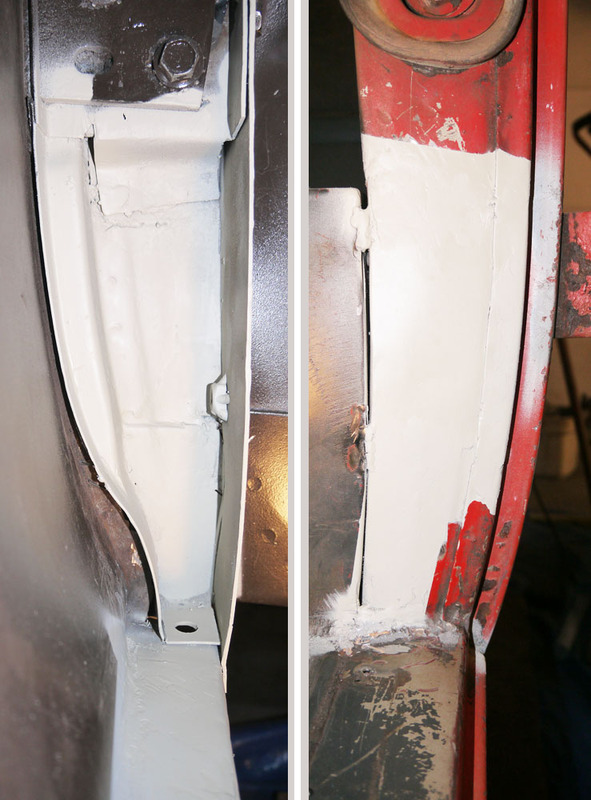 No hope for replacement body parts here - a left side door jamb – since there aren’t many (any?) 8-door FCs being parted out these days; so fabrication is necessary. 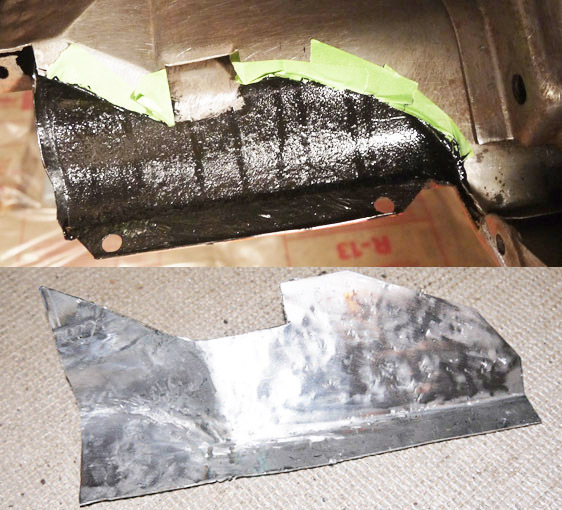 As explained above, several factors were considered when choosing where to cut the old metal, and how to piece together the replacements, such as being able to reweld in suitable places. Here, there is another issue… being sure not to loosen/alter the position of the hinge mount, which could screw up positioning of the door. The lower extension of the cut was made in order to remove some of the rotted metal behind it. Here’s two of the refabricated pieces. The large one will form the inside face of the jamb and a vertical brace in the rear. 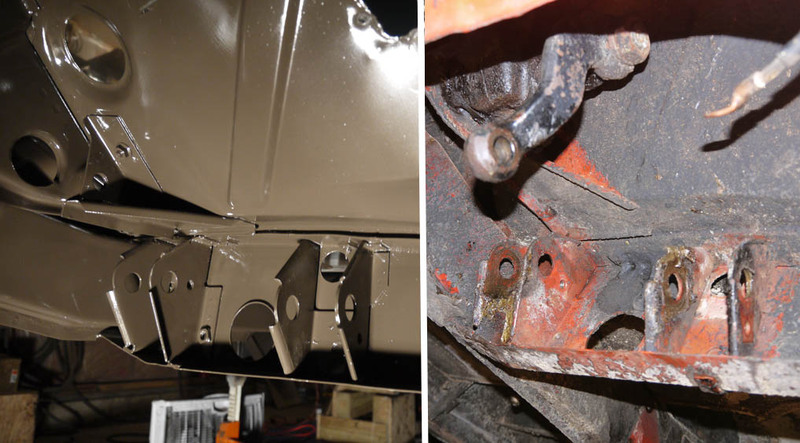 Note that body screw nuts are being replaced, and holes are provided where plug welds will replace spot welds. Overall, seven pieces were required, which included repairs to the exterior skin below the jamb. Here, replacement parts are being installed. 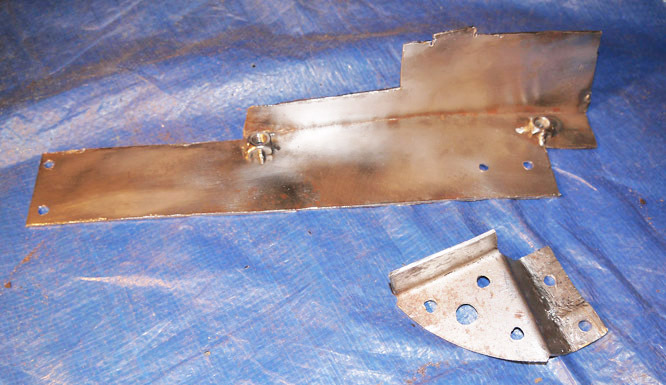 I had to plan carefully the order in which the pieces will be installed so that appropriate welds could be made, and ground down – I intend that the restoration will not be apparent on either side. 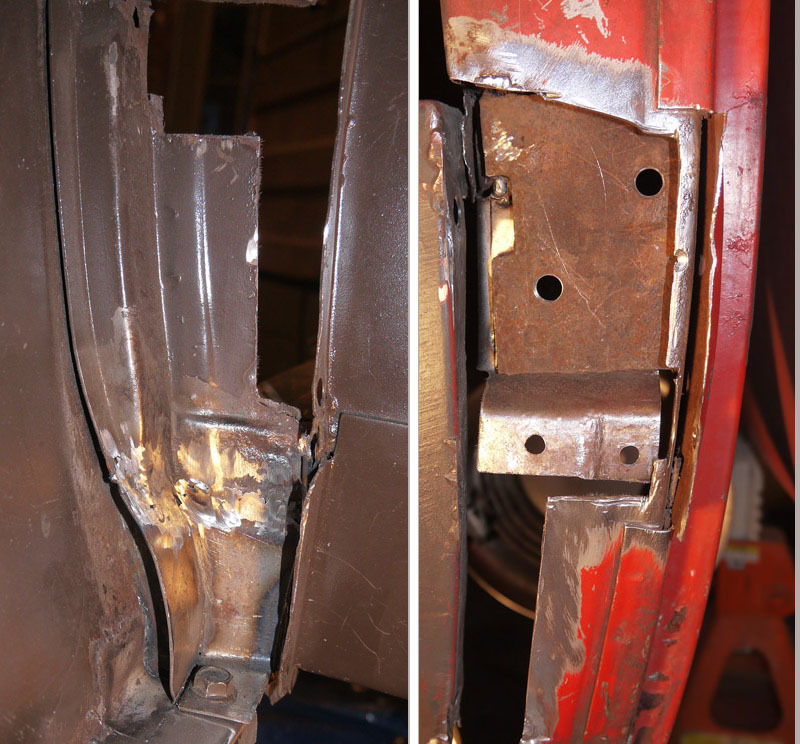 During the repair, the upper hinge was not removed and the door was supported from below. 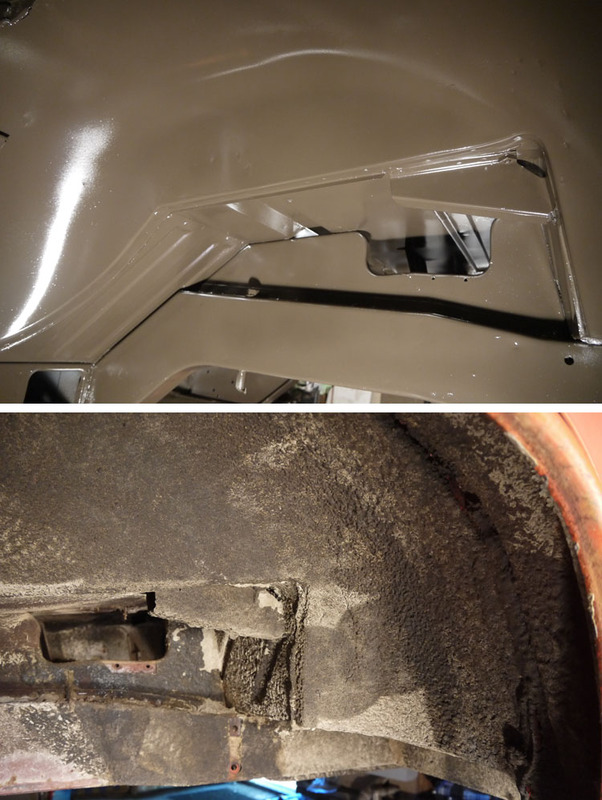 Before I made some final welds, the lower hinge was reinstalled and I confirmed that the door would still shut correctly. Here's the completed repair after applying epoxy primer. I don’t know about you all, but I’m much better at pulling out tools as I need them than putting them away when I’m done. Which, inevitably soon results is a chaotic mess of tools, debris, and electrical cords, within which I can never find what I need when I need it. You are the Metal Maven! Some great fabrication and welding work, sir. Thank you also for providing your detailed reference as you perform this work. My original San Diego Greenbrier also has some rust issues! This will be a big help when I get around to slicing and dicing the repairs on mine. THis is amazing. Such great work. All Hail the mighty power of a Dremel Tool! One of the most useful tools I have for fabricating and other detailing. I have a diamond wheel in mine right now to do special angle cuts on the next phase of ceramic tiles I am installing in the house. One of these days I will buy a good quality flexible extension shaft for my Dremel tool. A cheap one I bought recently came from China, and within 10 minutes the shaft broke. Essentially done, because there is still some body work to be done. In summary, here's the steps I followed to remove the undercoating and refinish. 1. 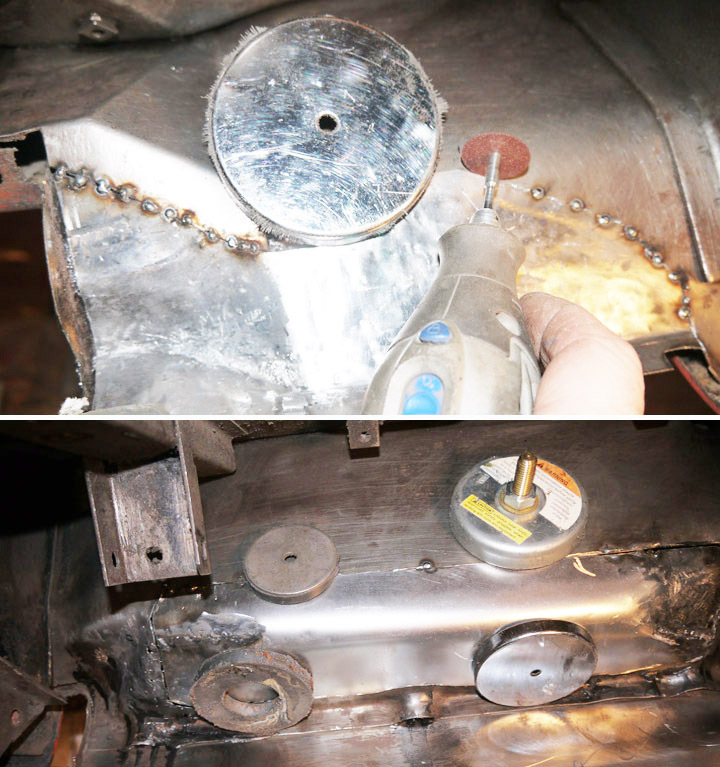 Remove bulk of UCing; heat and vibratory tool or dry ice and scraper. 7. 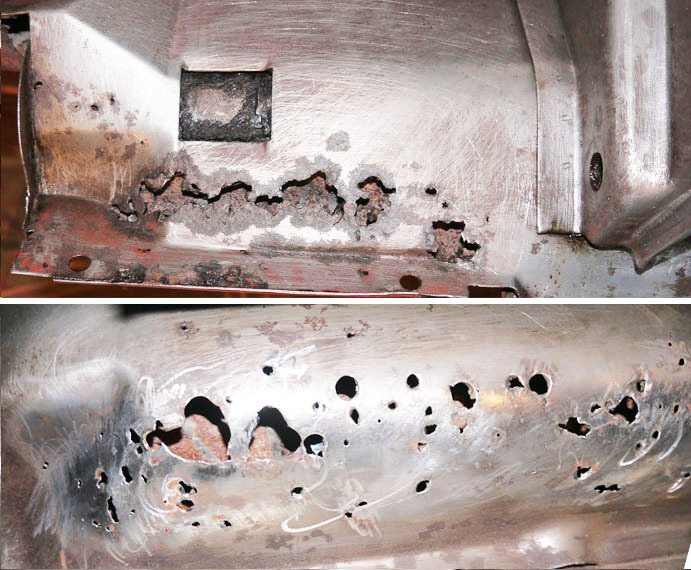 Rust treat: POR 15, only on areas with surface rust. 8. Prime: Omni 170 epoxy primer after POR 15 is slightly tacky but not yet cured. 9. Paint!!! : PPG DCC Acrylic Enamel; before primer cures. I wore a full face respirator when using the stripper and when priming and painting; and replaced the filters 5 times - whenever I found fumes leaking through. Lot of work...but a great refinish! Holy Hell,Steve! 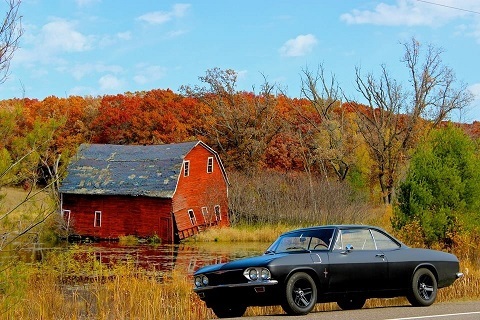 Would you be willing to restore the Loadside? 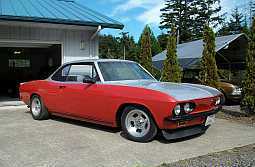 If given the choice on restoration shops,and the wherewithal,..."YOU" are the top of my list! I'm cursed with the belief that I can do many things cheaper and better than someone I would pay to do it; and thus, can't bear to pay someone a lot of money to do mediocre work. 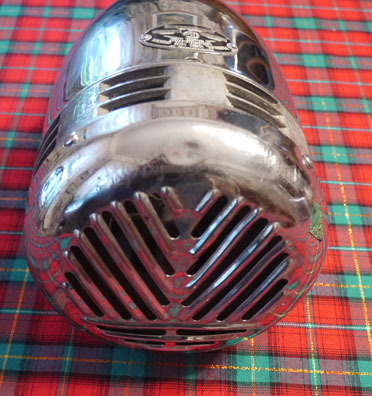 And here's a recent acquisition - the original siren from the Firebrier!! It was generously gifted by someone from the Malden West Camp Fire Company. This is a Federal Siren 66G siren - a monster of siren - and can be seen in the original painting of the Firebrier (back on thread page 1). Overall, it's in excellent condition. 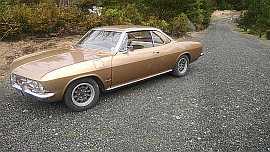 I'm looking into having it restored. Absolutely phenomenal work and outstanding craftsmanship! I love so see this kind of proud detail. It's rarely found these days. And yes... I also believe, almost like you.. that I can do every bit as "bad" a job as the so called professionals! Most of the time I like to think I can do better. The gratification when finished is huge. We can hardly wait to see how the top side of this Fc turns out.